This in-depth article focuses on a child who at first resists learning during summer, but is won over by the activities of Culture Camp. It also walks us through the origin of the camp curriculum and its application by the Urban League of Broward County. 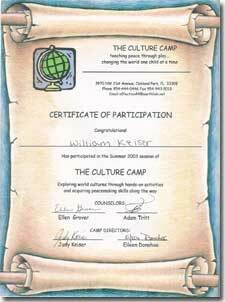 This short feature highlights the peace-making purpose of the Culture Camp curriculum. "All of the items were a wonderful addition to our program. Children greatly enjoyed seeing real world artifacts from around the world. They had many questions and were very curious, exactly what we had hoped for!" "The peacemaking concepts of The Culture Company workshops are presented in a way that is well-suited for upper elementary school-age children, and three world cultures are woven into the story in ways that increase appreciation for those cultures. Best of all, the process itself engages the kids, by appealing to their pride in their talents, their ability to appreciate the talents of their friends, and the natural appeal of a performance opportunity. I look forward to featuring other Culture Company programs in the future, and recommend The Culture Company highly." "What really made the Culture Camp Curriculum different was the way that it engaged the students in active learning projects using a multi-sensory and culturally competent approach. The projects allowed the children to immerse themselves in a variety of cultures, which creates the opportunity to see the world differently, through different eyes and a different perspective. This would have the result of breaking down a child's natural inclination towards egocentrism, to help create more empathy, understanding, and acceptance of differences. Students also gained a better knowledge of their own heritage and the backgrounds that they may have in their family history, which is so important for the development of a sense of individuality and identity." "The hands-on activities were great!" "The Culture Camp is all about peace through play, teaching tolerance, teaching cooperation, exposing youngsters to other cultures and environments." "By experiencing the language, customs, music, games, literature, crafts, dress and cuisine, the youngsters come to realize that "we're not separate people. We're all the same despite our separate backgrounds." New Hope World Outreach Camp Hope: integrated Culture Camp into a full-summer program as a literacy component. Cool Kids Learn, Inc.: integrated Culture Camp into both full-summer program in Miami-Dade County, Florida and after-school program in Miam-Dade and Broward Counties, Florida. Unitarian Universalist Church of Fort Lauderdale: used both our Culture Camp Summer Sundays religious education curriculum and the 2-week Culture Camp curriculum. "Culture Camp is exactly the kind of program so vital today in our multicultural world. Hopefully it will teach children to understand and appreciate those who are different from them. " Packing our passports - ready to go! 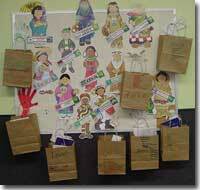 "I personally enjoyed using the culture camp curriculum, and found that the children liked the stories and projects. I was very impressed at the breadth of coverage of the entire world, with every country and region being treated as both fascinating and fun." "A very wonderful curriculum. Good group of children. Field trips really added to campers and staff enjoyment! I did learn, and enjoyed: thanks for the experience!" "World peace is possible only when we appreciate all of the people who share this planet. By helping children to understand the accomplishments and contributions made by societies from every continent, Culture Camp does much to build the global community that, inevitably, is our destiny." "By adding personal experience, students see the experiences are not far removed and remote, but may be closer to home and relevant." Unitarian Universalist Fellowship of Boca Raton: split one summer of Summer Sundays curriculum into 2 years of end of summer programs to kick off academic year religious education activities. Also pioneered Cultural Tour of World Religions year long religious education and curriculum. Unitarian Society of Germantown, Philadelphia, PA: used Culture Camp Summer Sundays two summers in a row under two different Directors of Religious Education. 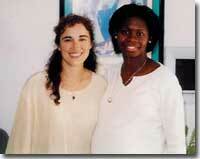 Unitarian Universalist Congregation of Atlanta: ran a one-week Culture Camp in 2005 and 2006. Demand in community led them to double the number of campers they expected the first year, and a 50% increase over that number in the second year! Unitarian Universalist Congregation of Gwinnett: also ran a one-week camp in 2005. Unitarian Universalist Congregation of the Palm Beaches: ran a two-week Culture Camp in North Palm Beach County, Florida. The kids enjoyed learning about places they would probably never visit yet they will have a mental picture thanks to the Culture Camp. I personally enjoyed the Culture of Peace. It brought participants to one common ground. Kids also enjoyed the peace culture. Don’t judge them until you get to know them; do not judge people for how they look; that we need mostly the same things; to treat people the way you want to be treated. That I can be a very good friend; I can never learn too much; that I should appreciate what I have; I learned to listen better; I’m smarter than what I think I am; I can make different friends; I love learning about new cultures. I had an awesome time at culture camp; we ate food from different cultures; I found out that fighting doesn’t solve problems. One Culture Camper used the Three Breaths at home to calm her rambunctious little brothers and sisters down - her grandma was very impressed! Kids whose usual interests run to electronic games and rap music discovered how fascinating the cooperative Native American string game “Cats Cradle” could be – it became the fad of the summer. The little boy who had spent an entire year of Sunday school without making a single friend spent one week in Culture Camp and bonded with this fellow campers so strongly that even the following March he remained strongly connected to them!